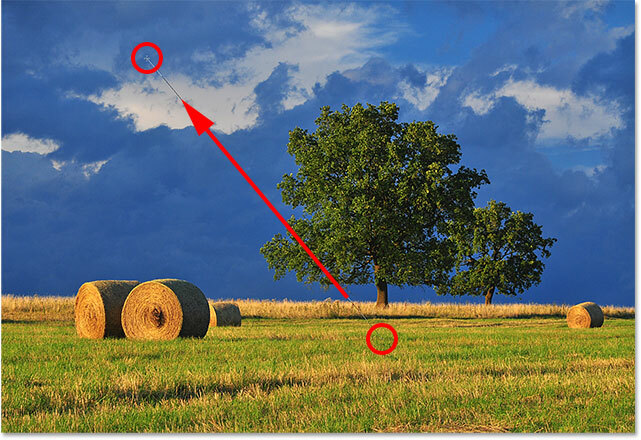 In this tutorial, we'll learn how to add a rainbow to a photo! 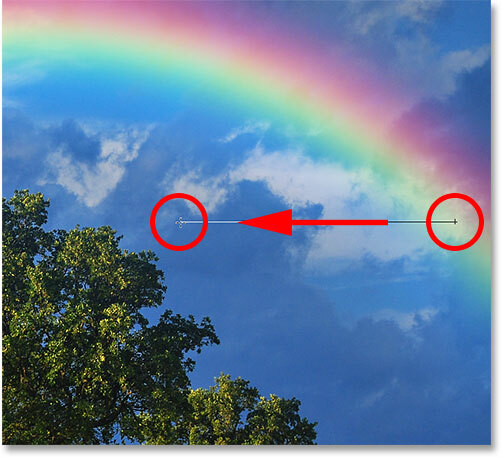 As we'll see, drawing a rainbow in Photoshop is actually easier than you might think. That's because Photoshop includes a built-in, ready-made rainbow gradient for us to use! All we need to know is where to find it and how to draw it using Photoshop's Gradient Tool. On its own, the rainbow gradient doesn't look very realistic, but that's okay. It still gives us a great starting point. 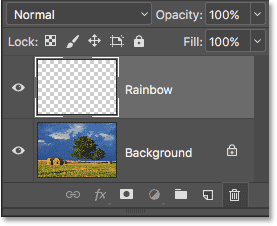 Once we've drawn the initial gradient, we'll learn how to combine it with a Smart Filter and a layer mask to blend the rainbow in perfectly with the image. I'll be using Photoshop CC but everything we'll be learning is also compatible with Photoshop CS6. 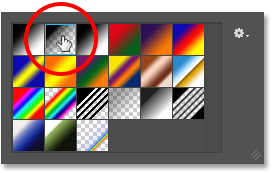 If you're using Photoshop CS5 or earlier, you can still follow along here, or you can check out the original Add A Rainbow To A Photo tutorial. As with most photo effects, it helps if we start with the right type of image. 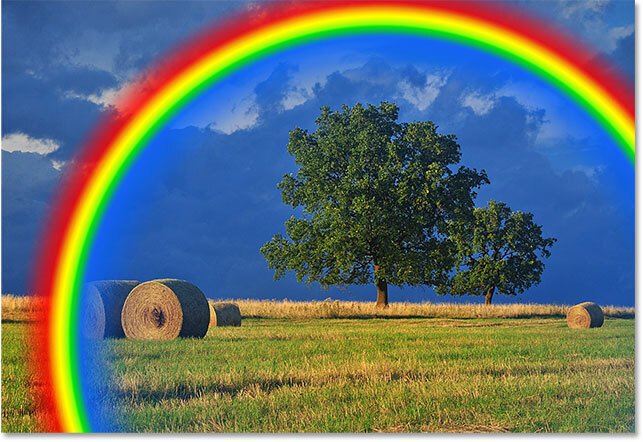 Since we'll be adding a rainbow, a photo taken outdoors would be a good choice. If it happens to be a landscape photo with some storm clouds in the background, even better. The original image. Credit: Adobe Stock. 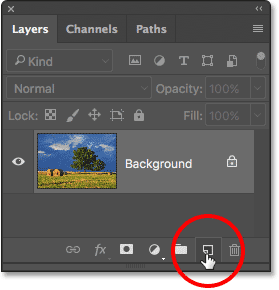 Clicking the New Layer icon while holding Alt (Win) / Option (Mac). The new "Rainbow" layer has been added to the document. Clicking the arrow to the right of the gradient preview thumbnail. When the Gradient Picker opens, you'll see small thumbnails of the various gradients we can choose from. If you haven't yet loaded any other gradients, you'll see only the default set. 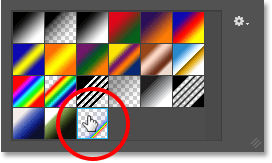 The rainbow gradient we need is not part of this default set, but it is included with Photoshop. It's found in the Special Effects gradient set. All we need to do is load the Special Effects set into Photoshop. 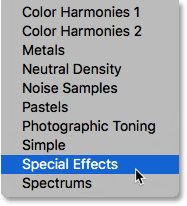 Selecting the Special Effects gradient set. Selecting the Russell's Rainbow gradient. Clicking the gradient preview thumbnail in the Options Bar. 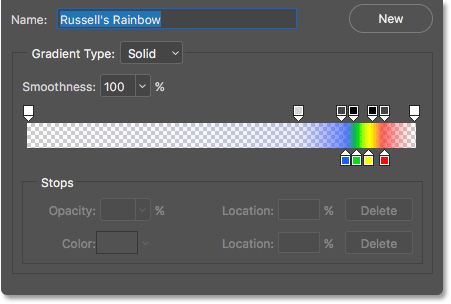 The Gradient Editor showing us what the Russell's Rainbow gradient looks like. Clicking Cancel to close the Gradient Editor. Step 6: Set The Gradient Style To "Radial"
By default, Photoshop draws gradients in a straight line, known as linear style. To draw a rainbow, we need to tell Photoshop to draw a round (radial) gradient instead. Selecting the Radial gradient style icon in the Options Bar. Drawing a radial gradient with Photoshop's Gradient Tool is a two-step process. First, we click somewhere on the image to set a starting point. This point will become the center of the gradient. Then, with our mouse button still held down, we drag away from the starting, center point to set the size of the gradient. The further we drag, the larger the gradient will appear. Even though drawing a gradient in Photoshop is very simple, this is actually the trickiest part when it comes to adding a rainbow to an image. That's because the size and position of the rainbow will depend entirely on where, and how far, you've dragged. 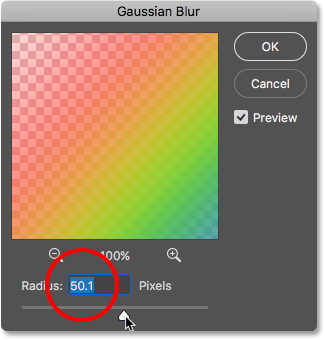 Clicking to set a center point for the gradient, then dragging away to set the size. The first gradient is too small, and it's in the wrong spot. Going to Edit > Undo Gradient. Drawing a larger gradient, this time starting below the tree. The rainbow now appears at the size and location I wanted. Step 8: Change The Layer Blend Mode To "Screen"
So far, so good. We have the rainbow gradient in place. Of course, it's not looking very realistic at the moment. One of the problems is that the gradient looks like it's just sitting in front of the photo. We need to blend it in with the image, and we can do that by changing the "Rainbow" layer's blend mode. 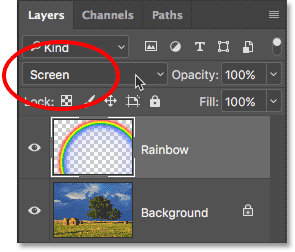 Changing the "Rainbow" layer's blend mode to Screen. The result after changing the blend mode to Screen. Another problem with the rainbow is that the transitions from one color to the next are too well-defined. We need to soften them, and we can do that by blurring the gradient. We'll blur it using Photoshop's Gaussian Blur filter. But before we do, let's convert the "Rainbow" layer into a Smart Object. That way, the Gaussian Blur filter will be applied as a Smart Filter, allowing us to go back and change the settings if we need to. 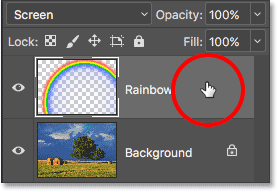 Right-clicking (Win) / Control-clicking (Mac) on the "Rainbow" layer. Choosing the "Convert to Smart Object" command. 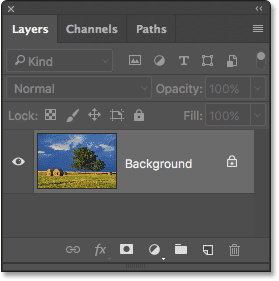 The Layers panel showing the Smart Object icon. This opens the Gaussian Blur dialog box. 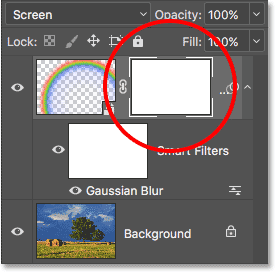 Keep an eye on your image as you drag the Radius slider along the bottom of the dialog box towards the right. The further you drag, the more blurring you'll apply to the rainbow and the softer the transitions between the colors will appear. 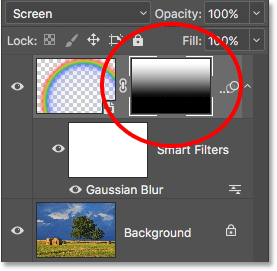 The Gaussian Blur filter dialog box. The result after applying the Gaussian Blur filter. Since we applied the Gaussian Blur filter not to a normal layer but to a Smart Object, it was automatically converted into a Smart Filter. 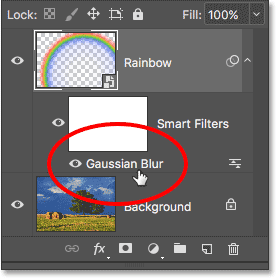 We can see "Gaussian Blur" listed as a Smart Filter below the "Rainbow" layer in the Layers panel. Smart Filters can be re-opened at any time just by double-clicking on them. 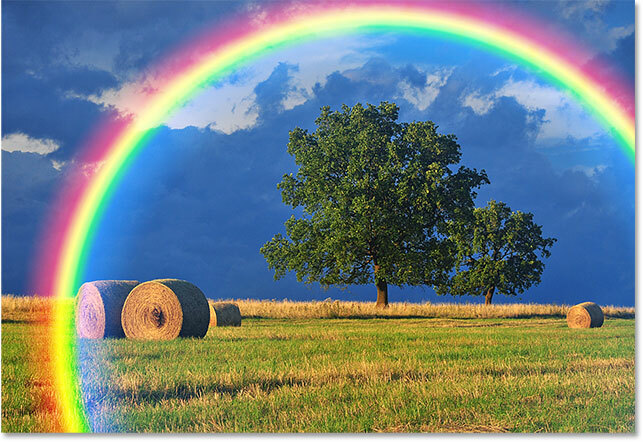 The one remaining problem with the rainbow, at least with my image, is that the bottom of it extends all the way to the bottom of the photo and across the ground. 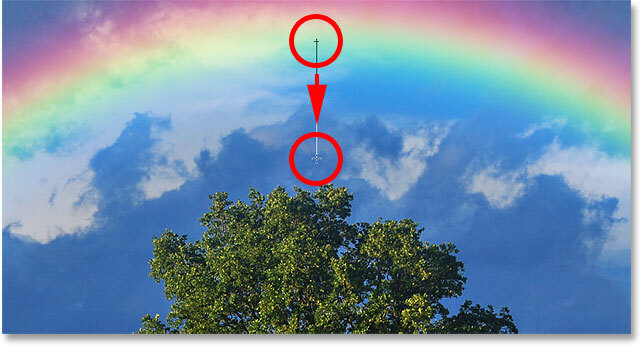 We need a way to hide the bottom part of the gradient so that the rainbow only appears in the sky. We can do that using a layer mask. A layer mask thumbnail appears on the "Rainbow" layer. In a moment, we're going to use Photoshop's Foreground to Transparent gradient to hide the parts of the rainbow we don't want to see. But for it to work, we first need to make sure that our Foreground color is set to black. The Foreground color (upper left swatch) should be set to black. Clicking again on the arrow beside the gradient preview thumbnail. 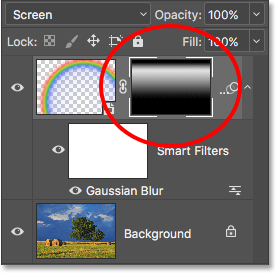 Double-clicking on the "Foreground to Transparent" gradient. Step 14: Set The Gradient Style To "Linear"
Clicking the Linear gradient style icon. 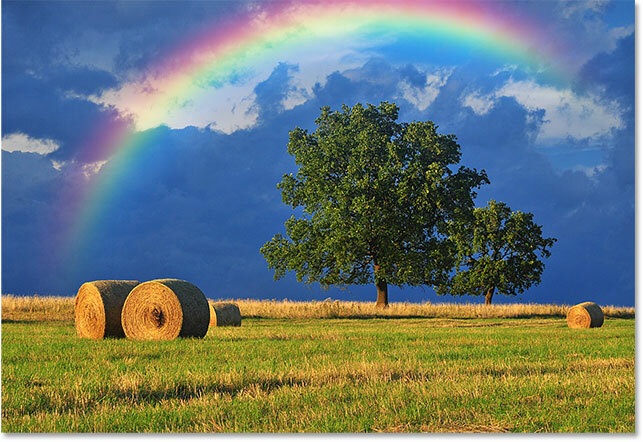 With the Foreground to Transparent gradient selected, black as our Foreground color and the gradient style set to Linear, all we need to do to hide the part of the rainbow that's visible below the sky is draw a gradient from the horizon line up to the top of the rainbow. Dragging from the ground up to the top of the rainbow. 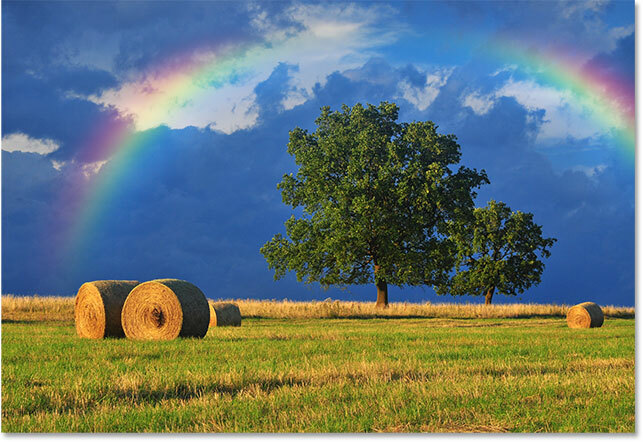 The rainbow now appears only in the sky, increasing in brightness the higher up it goes. The layer mask thumbnail showing the gradient. You may be wondering why I chose the Foreground to Transparent gradient here rather than Photoshop's standard Black to White gradient. The reason is that the Foreground to Transparent gradient gives us the freedom to hide other parts of the rainbow as well, if we need to. Drawing a second Foreground to Transparent gradient, this time to hide the top of the rainbow. The top of the rainbow disappears, while the bottom also remains hidden. The layer mask thumbnail showing the two combined gradients. Drawing a Foreground to Transparent gradient from the right. The gradient now appears to fade away towards the right. Again, this isn't really the effect I'm going for with this image. I'm just showing some examples here of why the Foreground to Transparent gradient can be a better choice over the standard Black to White gradient when adding a rainbow. I'll quickly undo my second gradient by pressing Ctrl+Z (Win) / Command+Z (Mac) on my keyboard. Click the visibility icon to toggle the rainbow on and off.